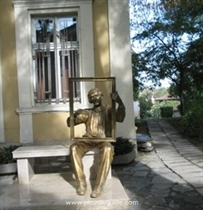 National Award for purity of BG language was founded in Karlovo. The award will be wearing the name of the eminent BG Revival period figure who was the publisher of the first newspaper ?Bulgarian Eagle?, Dr Ivan Bogorov. The Deputy Mayor of the <?xml:namespace prefix = st1 ns = "urn:schemas-microsoft-com:office:smarttags" />Karlovo Municipality, Dipl. Eng. Dimiter Katsev had a meeting with representatives of the Union of BG Journalists and the Union of BG Writers on the occasion. He invited the two groups of intellectuals to become co-founders of that award. The Ivan Vazov National Library in Plovdiv and the Presidency of the Russian Academy of Sciences for Eastern Europe invite you all to a bazaar exhibition ?The Latest Scientific and Popular Literature from Russia?. It is opening February 6th, 3.30 PM, at the Library Foyer, and is closing February 10th.